IT'S SWARMING SEASON! If you have a "bee problem" where you see bees filling the sky or a clump of bees hanging together on a tree, mailbox or car, PLEASE call one of our Swarm Catchers! See the "Swarms" page above or use this link to go directly there: https://tvbachatt.com/page-18089 You can also read there about how non-dangerous honeybee swarms really are. Please don't spray! The mission of the Tennessee Valley Beekeepers Association (TVBA) is to promote the study, science and craft of beekeeping, and to provide education and encouragement to all. A registered 501c(3) not-for-profit organization, TVBA holds regular meetings on the fourth Monday of every month, hosts and participates in yearly beekeeping events, and provides a mentorship class for beginning beekeepers. You can find others just getting started with beekeeping, as well as those who have been at it so long they do not want to confess. There's usually a fair amount of "bee talk" going on both before and after our monthly meetings. So if you want to learn, plan to come early and stay late. Various educational opportunities, including the Mentorship Class for Beginning Beekeepers. These events all address the TVBA mission statement above, and are accompanied by a sense of cooperation, collegiality and fun. We value the support of our state apiarist and the University of Tennessee at Knoxville Extension Office. Registering your hives through the state is the law, and the best way to protect your investment from errant spraying of insecticides and other known threats to your bees. We can help you get protected. TVBA's mentorship class is one of the finest to be found in how it pairs beginners with experienced beekeepers over a period of months. 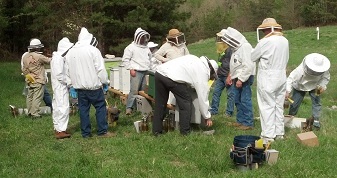 New beekeepers starting with no knowledge or equipment complete the program with state-registered hives as well as the basic equipment and understanding they will need to continue beekeeping. 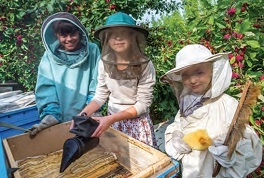 Beekeeping can be an individual or a family activity and we encourage young beekeepers to join the program. All who participate will learn an appreciation of nature that will last a lifetime. Because lifting a “super” full of honey can be a challenge we require that an adult participate with anyone under 16 years of age.  Our recommended area resources and sites.  Local people, local events, local information. Looking for a contact to handle a swarm of bees? See our "Swarms" page right next to our "Home" page! Our monthly meetings are held the fourth Monday of every month. We are currently meeting at the Red Bank Presbyterian Church, located at 4320 Dayton Blvd, in Red Bank, Tennessee, just outside Chattanooga. Zip code is 37415. The round red "push pin" on the map at the right shows you the church location. Click on the map to open it. You can zoom in and out with the plus and minus keys.